Whoa! That longhouse is rocking man. 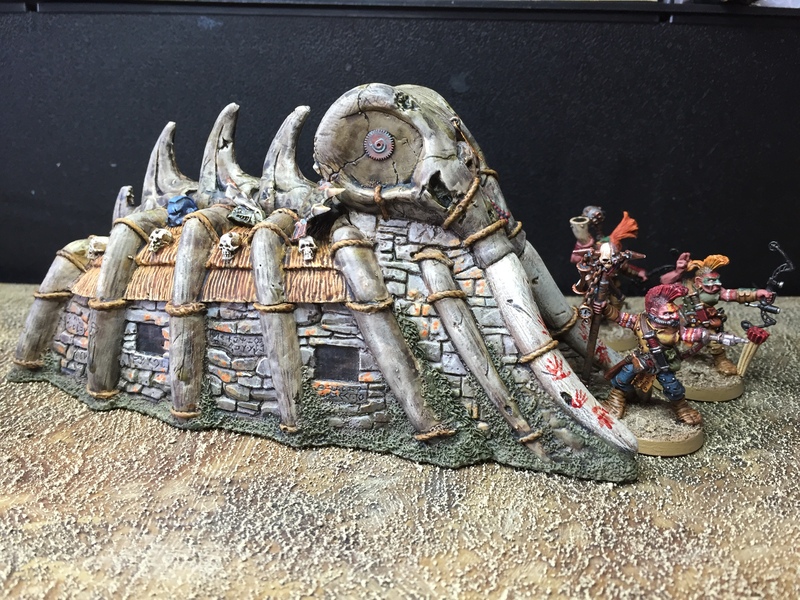 Love the tusks and the blood. The new model is shaping up nicely. He looks very mean. Not sure if I’ve asked this already but where did you get the drill from? 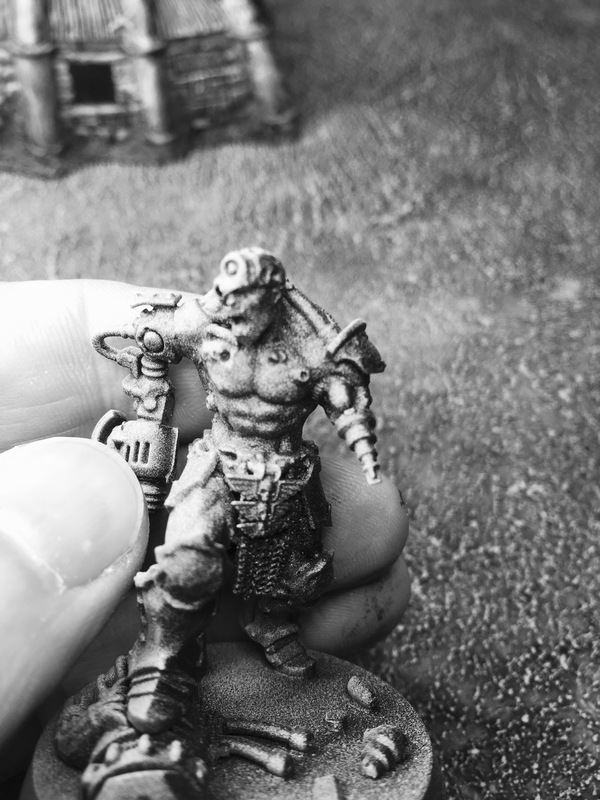 I’m working on some Pit Fighters and have used mechanical tools from Orks but they are on the largish side. They kind of work but Id like an array of tools to choose from. Excellent work as always. I can’t wait to see the mean machine painted. Anyhow, it’s just made with odds and sods from the bits box. Ahhh ok. Well it looks cool. 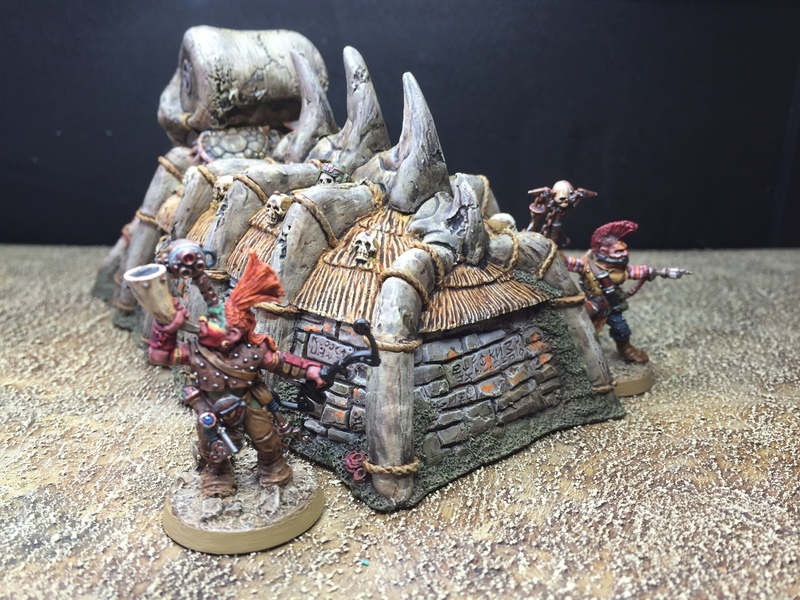 I quite enjoy making terrain but I find I have to be in the mood for it. I’ve got a large modular board in the works. I’m also considering a graveyard and gallows for my Judicators project. Wow. Never heard of this before. Pretty cheap for what you get. Think I’ll visit a store this week. Cheers mate. I agree with Mr Imperial too, that terrain is way cool! I’ve never heard of that specific zenith technique where you spray over “wet” paint. I’m interested to see how it turns out. Likewise, I’d be happy to set up a game once my house is back together again… I’m in Hertfordshire, where abouts are you? Or move the continents closer together, whichever is easier. Great stuff, Alex. 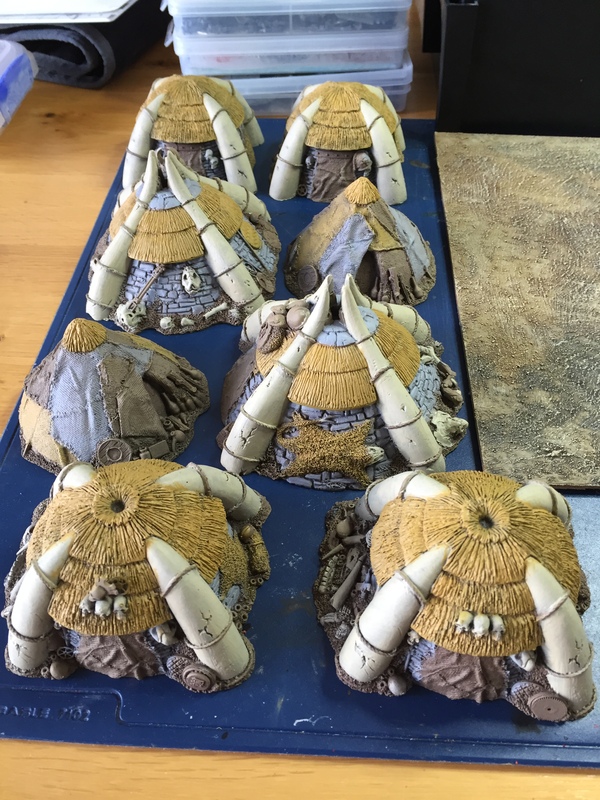 I remember those huts from back in the day, and they’ve come up very nicely indeed, and very appropriate for your growing frostgrave-ish warband. 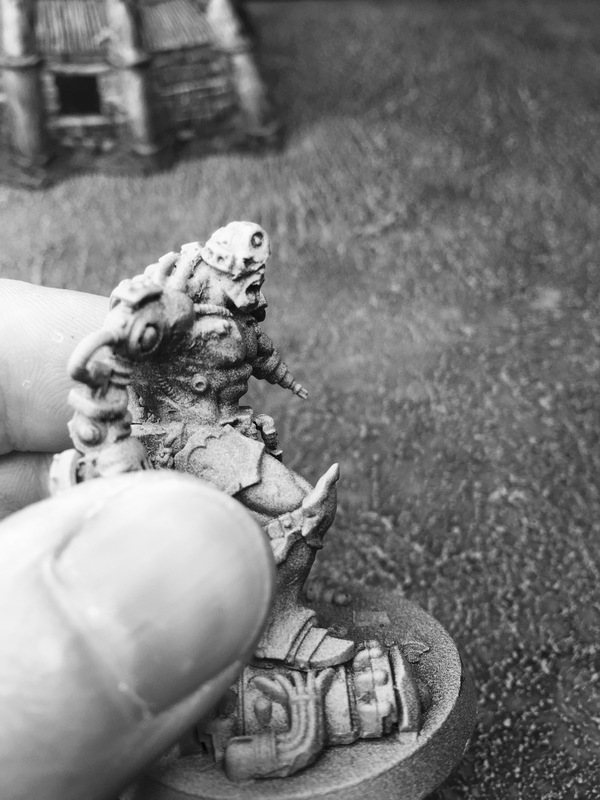 Mean Machine is looking great as well – what sculpting did you do on him? Thanks dude, they do go well together don’t they? 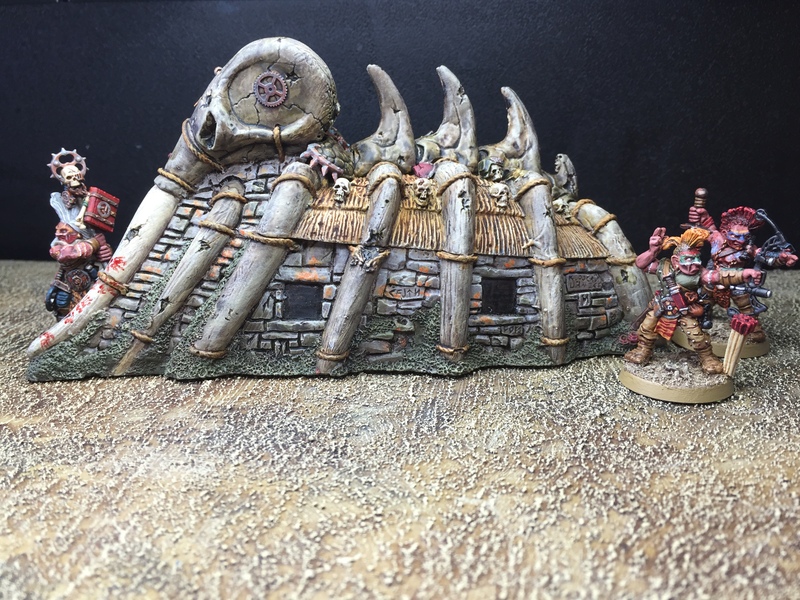 I think they would work quite well with Orks too… I’ll probably scratch build a few other bits as well – a water tower, some kind of scrap wind turbine, cooking fire, stuff like that… just a few bits to techno the set up a little. Mean machine looks really cool. Great work! And so you should be … superb. Loving Mean Machine. I think my favorite part is that it’s not immediately clear what horrible devices are on his arms. Really ups the creepiness factor. You know what’s a deceptively good place to paint? The bathroom, provided you have a bit of counter space. You’ve got all you need, really. Running water, good overhead light, and a toilet to use as a seat. Don’t even get me started on how nice it is to leisurely work on a model when nature calls and you have to commit 20 minutes or so to the bathroom anyway. Okay so maybe it’s a stretch but it worked for me on at least two occasions. Mean Machine is…….. well looking mean :) Good work and the scenery is the bomb! Thanks dude, I’d quite like a full sized one in the garden :-) First, I’d have to acquire scratch-build ninja skills like the ones you used on your latest project!